The dates on a few of these pictures might be wrong by a year or so, but for the main part are accurate. 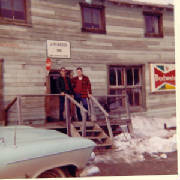 Livengood Inn - Livengood, Alaska - Spring 1966. 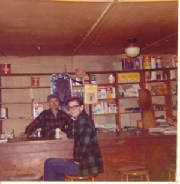 This is me with Tony, one of five year 'round residents of this once-thriving mining town in the general store/ dance hall. 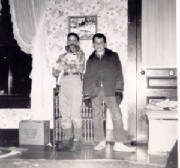 Kent Adams (right), an Alaska friend originally from Moscow, VT, and I were the first car through from Fairbanks to Livengood in the spring of 1966. 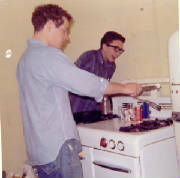 Jim Buckley (left) and me cooking over the kitchen stove at our house at 75 E. Woodruff Ave. - Columbus, OH. 1963. Farm pond bass. Summer 1962. Circleville, OH. 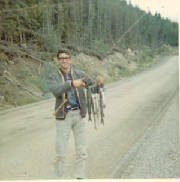 Catch of grayling from a stream along the Alaska Highway (probably somewhere in the Yukon) - my first trip to Alaska in August 1965. 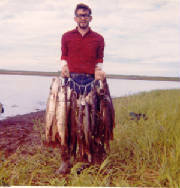 My first ever fly-in fishing trip - north of Fairbanks, Alaska, summer of 1966, with my friend Ben Barrera. 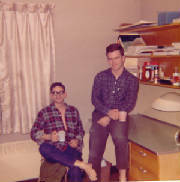 Roommates and best friends in Columbus, OH - 1964 - From left, me, Jim Buckley, Pete Tinn. We're dressed for Pete's wedding. Pete's 60th birthday (March, 1990)- Surprise party in Columbus. From left, Pete Tinn, me, Jim Buckley. 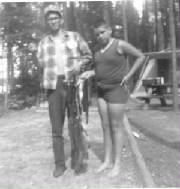 Brother Chris (right) and me - Quetico Park, Ontario. Summer 1964. Days before computers. 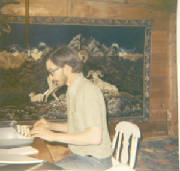 Dryden, ON 1971. Hippy days, 1971. Dryden, ON. That's me in the red and black checkered coat and stylish hat. I can't remember who the other guys are. 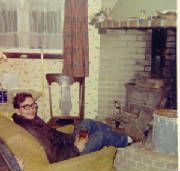 Winter 1971 - Dryden, ON. 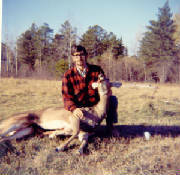 Fall 1970 - Dryden, Ontario. 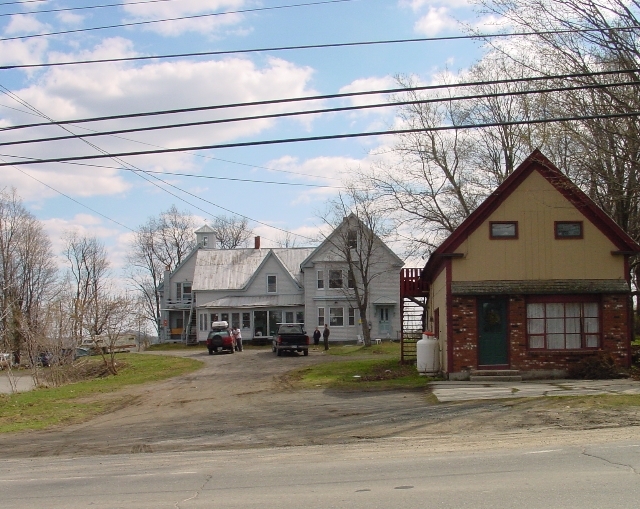 8 Pine St. - St. Johnsbury, VT. Sitting on one of Ira Hatch's yard benches. From left, me, Loche, Barb, Paula. This was taken BC (Before Chris). My good friend Jamie Balivet (right) and me (and Butch, the dog). 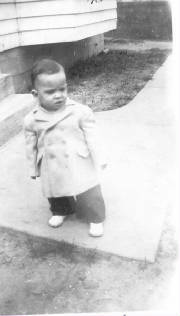 Jan.23, 1953 - I think on Pine St. in front of our house. I'm pulling the sled. 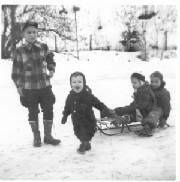 Believe Paula and Barb are on the sled and Chris is in front shouting at the camera. 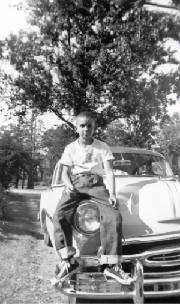 Me - 1950 - in front of one of the Hatch yard benches. 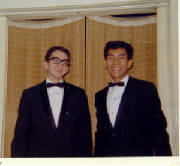 8 Pine St. - St. Johnsbury, VT.
Me with best friend Pete Tinn in Columbus, OH just before his wedding. We got lots of laughs getting fitted for the tuxes because the tailor had to run a tape measure right up the inside of our legs from the ankle to the crotch and we weren't used to having somebody else's hand in our crotches. Seemed very funny at the time! April, 1957 in our backyard (1 Aaron Dr.?) in Richmond, VA. From left, Chris, Loche, me, Barb, Paula. 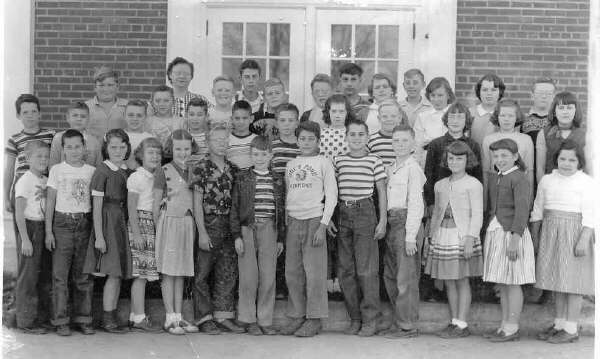 Grade 7 class picture - Bon Air Elementary School (Richmond, VA). Taken Apr.8, 1957. I'm in the front row, third from left. 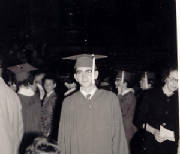 High school graduation (Circleville High School - Ohio) June, 1962. Midland, MI. 10 months old. Could I really walk then or was I being propped up? 4H Camp in Vermont. I can't remember the girl's name. She was from Hardwick, VT and at camp the same week I was. We were madly in love for three or four days, but haven't seen each other since. Danville, VT. Not sure, but I think this might be my (mother's brother) Uncle Art's new car when he came from Michigan to visit us. This has to be the coolest house in the world!! Our place in Danville, VT. I'm told this picture may be from the 1890 era. 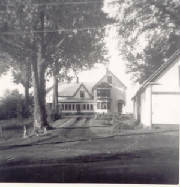 The granite stone in front of the porch that is engraved "Steele" was still there in the 1950s. Grade 4 - Mrs. Ailes' class. Danville, VT. I'm third from right in the middle row. Grade 5 - Miss Exley's class. 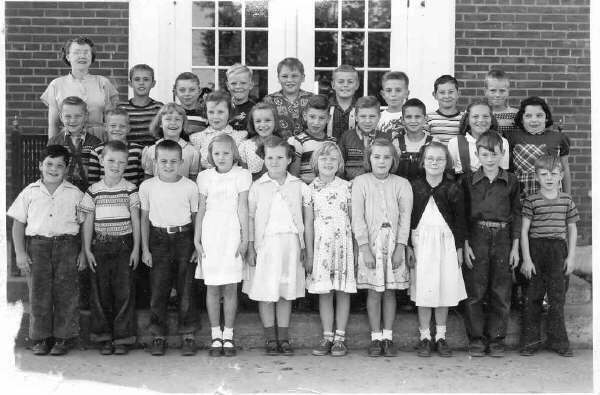 Danville, VT.
Middle row - fifth from left. Miss Exley is my favorite teacher of all time. 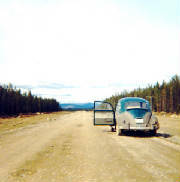 Alaska Highway, enroute to Fairbanks, August 1965. 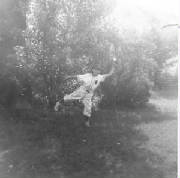 Not real sure of the date, but believe it's about 1954 in Danville, VT where I played on a Little League team. Rosewood Ave. - Circleville, OH - June 1959. 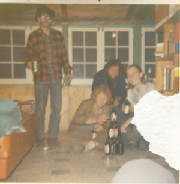 From left, me, Chris, Barb, Dad, Paula, Loche. As usual, Ma was behind the camera. MacKenzie brothers and sisters at Christmas at the Barney's in Columbus - Dec. 1987. Back, from left - Paula Moore, Barb Barney, Loche Kline. Front, from left - Chris, me. Same bunch - different year. This was taken on Ma's Thanksgiving Caribbean cruise - Nov. 2002. 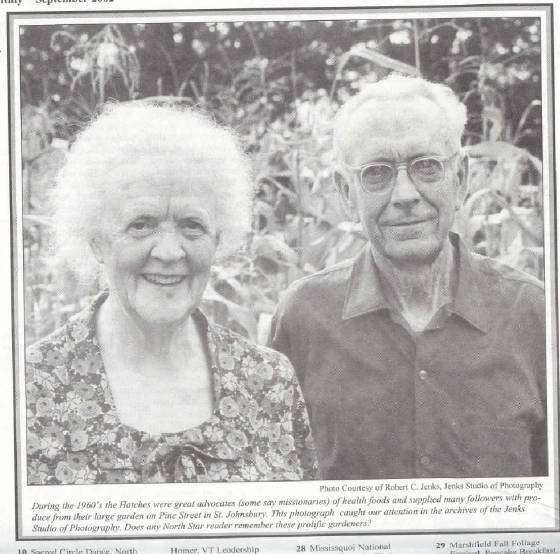 Your Sept. issue picture of Ira and Mildred Hatch was a beauty! It brought wonderful, long-ago memories racing back to me. 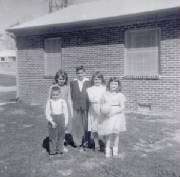 My family lived downstairs in the Hatches' house at 8 Pine St. from 1949 to 1953 before we moved to Danville. The Hatches lived upstairs. I was 5 - 9 years old during those years. I recall Mr. Hatch working always with wheelbarrow, shovel and ax. He transplanted many trees, hauled countless loads of dirt for yard landscaping, and constructed benches made out of logs for the lawn. And there was the garden! The Hatches must have had the lushest plot in all of Vermont, and they definitely built the world's most awesome compost pile. 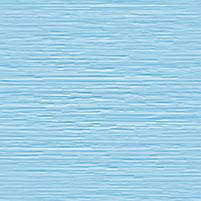 Mrs. Hatch worked incessantly writing and sending letters. I didn't understand fully at the time, but know it had to do with her project involving health food. Although I was a frequent visitor in the Hatches' home over the years, I never was offered a cookie or candy as was common in other people's homes, but rather dried pumpkin seeds and all sorts of other nuts and fruits. Mr. and Mrs. Hatch explained that sugar wasn't a healthy choice and that cookies and candy weren't a part of their household. The Hatches seemed to love kids. I was always welcome to visit, but a knock on the door and the proper answer to their call of "Who's there?" was necessary. "It's me" would never gain admittance. "It is I" or "It's Richie MacKenzie" were the magic passwords. Living at the Hatches' place was living in a world of wonders for a young boy. Mr. Hatch was always ready with short lessons on stars and constellations, counting rings on a tree stump, toads in the garden, birds at the feeders, the honeybee hives out back, and hundreds of other marvels of the universe. 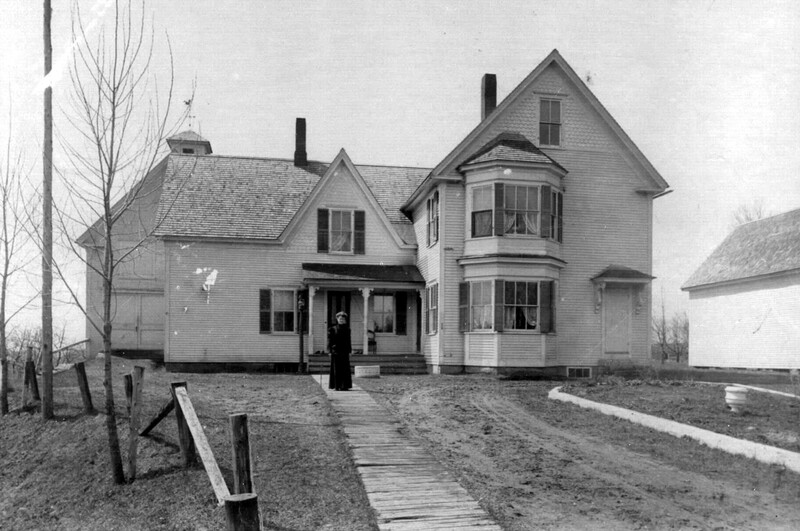 The Hatch home was the site of numerous exciting visitors, ranging from new immigrants to the United States, to talented performers who would perform small livingroom concerts playing violin or piano or some other musical instrument, to artists showing paintings and photographs. My parents, my sisters and I were always invited to come and be a part of the group. 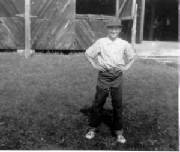 The most memorable visitors were the Fresh Air Kids who were hosted each summer by the Hatches. They were disadvantaged black kids from New York City who came in groups of four for two-week stays. We all played together and slept out overnight in the yard in makeshift teepees and tents. It was quite a change of pace and thrill for us all. One of the kids, Timmy, returned for several visits and we became particularly good friends. I laugh still when I remember the day Timmy and I went fishing. At some point during our roving down a creek and through the woods we came upon a big driveway with signs posted naming several kinds of fish to be found within. We explored further, and to our huge delight, discovered little ponds filled with fish. A quick worm on the hooks and we were experiencing a boy's dream of a lifetime - literally hundreds of fish savagely attacking our bait almost before it hit the water. Almost immediately after the first worm plunked into the pond we heard loud, angry shouting and looked up to see a grown man charging full speed down the driveway toward us. 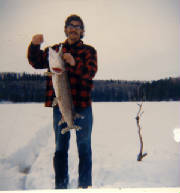 It didn't take long for two little boys, along with rods, reels, creels and worms, to hightail it back into the woods. I don't remember how long or how far we went before slowing down and looking back to assure ourselves that we were safe, but when we finally did, we spent some moments of disbelief and consternation puzzling over the question, "Why, if they don't want us to fish there, did they put up big signs advertising the fish?" 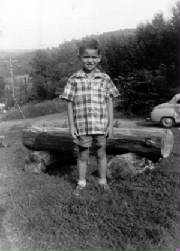 I never found out who the man who chased us was, but I wonder what in the world he must have thought when he looked out his window that day in 1952 and saw a little black boy in leopard skin swimming trunks and a little white boy, also in swimming trunks, fishing in the holding tanks of his fish hatchery in St. Johnsbury, Vermont. Besides the natural wonders that the Hatches helped me to understand, books and poetry were also big winners at 8 Pine St. I remember especially "The Swing," a Robert Louis Stevenson poem that Mrs. Hatch used to recite. She encouraged me to read and write and count, even before I started First Grade at the St. Johnsbury Trade School. One treasure was a book of poetry she gave me that included "The Swing." In my mind I can still see Mrs. Hatch's gorgeous white hair surrounding her face and hear her melodic voice reciting, just for me, "How do you like to go up in a swing, Up in the air so blue ..." It's a vision of unadulterated love and joy. 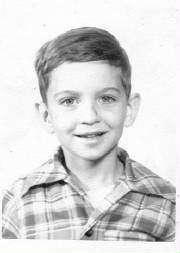 I have hundreds of other tremendously fond recollections of those boyhood days. The Hatches, and their son David, made a huge and very positive impact on me. Thanks for the picture!